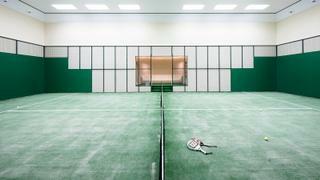 The 98.4 metre Abeking & Rasmussen flagship yacht Aviva takes sport on board to a whole new level, with a spectacular padel tennis court situated amidships that measures 20 metres long by ten metres wide with 6.5 metres of headroom. Launched in 2017, she was styled inside and out by the Reymond Langton Design studio and won a Boat International Design and Innovation Award for thus unprecedented lifestyle element. Feadship superyacht Savannah features a world-first — a semi-submerged viewing lounge. 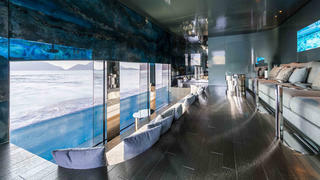 CEO Henk De Vries, who recently told Boat International that the Nemo lounge is the first semi-submerged window in a superyacht’s accommodation space. “With the central powertrain, there is room at either side [of the hull] where shafts might have been,” he explained. “This led to the idea of a floor below the waterline, a room at the side half submerged because the fun is in seeing both above and into the water at the same time.” Savannah’s Nemo lounge could have gone anywhere in front of the propellers, but its location links it to the pool deck and to the swim platform, where a complex hatch in the aft stairs provides secondary access. Guests relaxing in this area are treated to unique views and can enjoy the sunset at the same time as watching fish swimming beneath the surface. Feadship has been researching glass as a structural material for years and inviting build classification societies to witness its developments. “This gives them the confidence that we are building a safe solution,” Feadship’s marketing manager Francis Vermeer added. “The challenging part was to get a good, clear view and to fit the glass nicely in the hull.” While from inside the glass looks like a single slim pane, it is, in fact, a “belt and braces” approach of several laminated panes about two inches thick in total. For safety reasons, there are actually two windows: an outer window flush with the hull and a second one flanged to the interior of the room, each of which passed the class society destruction-testing requirements. 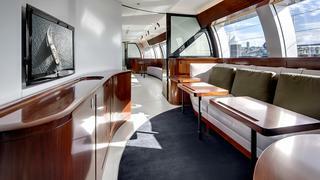 Feadship superyacht Savannah features a world-first — a semi-submerged viewing lounge. CEO Henk De Vries, who recently told Boat International that the Nemo lounge is the first semi-submerged window in a superyacht’s accommodation space. Savannah’s Nemo lounge could have gone anywhere in front of the propellers, but its location links it to the pool deck and to the swim platform, where a complex hatch in the aft stairs provides secondary access. Guests relaxing in this area are treated to unique views and can enjoy the sunset at the same time as watching fish swimming beneath the surface. While from inside the glass looks like a single slim pane, it is, in fact, a “belt and braces” approach of several laminated panes about two inches thick in total. For safety reasons, there are actually two windows: an outer window flush with the hull and a second one flanged to the interior of the room, each of which passed the class society destruction-testing requirements. When UAE yard Gulf Craft began construction of this 47 metre flagship yacht on speculation, the original plan was for a main-deck superyacht gym designed by Cyrille Bieri to be installed just to the fore of the saloon. But during the build this project attracted the attention of a buyer who had an entirely different idea for this area — a gentleman’s cigar lounge. Escape’s unique relaxation space features a pair of leather armchairs, a large flatscreen television, and of course, an octagonal table for storing the owner’s humidors and cigar cutters. The Gulf Craft design team's elegant décor shines through in this bonus room, with subtle lighting and precious stonework. Mystere Shadow is more than your typical superyacht support vessel. Sure, she can carry submarines, motorcycles, cars and helicopters for the mothership, but, after a redesign by Pastrovich Studio, she’s pretty luxe in her own right, with a pool, spa area and her own bonus room: a disco. 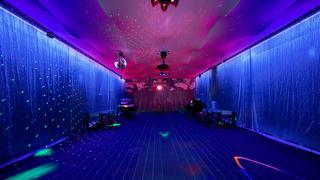 Sans toys, Mystere Shadow’s hangar becomes a full-on nightclub with laser lights, smoke machine and, of course, a disco ball. Pop music legend Billy Joel is a serial yacht owner — owning up to five yachts at one time, including a Shelter Island runabout he had a hand in creating. 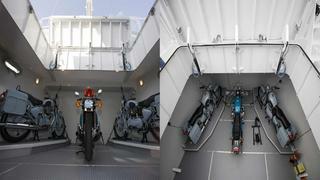 On top of this, he’s a motorcycle collector, and of course he needed a place to stow his motorcycles on his superyacht. Billy Joel had his Inace 95 Audacious (renamed Miss Sarah J in 2013) purposefully re-built to transform the forward lower deck into a bonus room — a garage for his motorcycles, which could be lifted out by a crane from the main deck above and ferried to shore on a landing craft boat. In a direct correlation to an increase in Chinese superyacht buyers, we’ve also seen an increase in the request for bonus rooms dedicated to the game of Mahjong in luxury yachts. 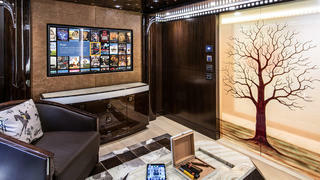 The Feadship yacht Blue Sky had a room specifically designed to play the tile game in. 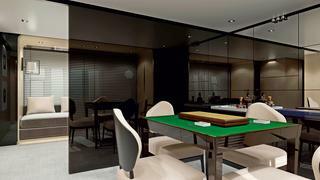 But this bonus Mahjong room has been seen on smaller yachts, including a few in the Azimut Yachts range, as pictured above. Who says you have to wait until the kids are grown up to take the voyage around the world? Certainly not the owners of sailing yacht Vertigo who put this classroom to good use while travelling with their young family. Outfitting the yacht with a classroom and bringing along a tutor meant the kids could keep up with studies while they sailed. This bonus room on the award-winning sailing superyacht Vertigo has desks and a SMART board — an interactive whiteboard hooked up to the computer that utilises touch recognition. Superyacht cinemas are always a favourite bonus room, creating a nice place to escape and hunker down for some movie bliss. With huge, comfortable couches, the cinema on Lürssen yacht Northern Star — currently for sale and available for charter — is particularly inviting. Superyacht cinemas are always a favourite bonus room, creating a nice place to escape and hunker down for some movie bliss. With huge, comfortable couches, the cinema on Lürssen yacht Northern Star —currently for sale and available for charter — is particularly inviting. You want to look your best when spending time on a superyacht, so what’s better than getting dolled up in your own beauty salon? 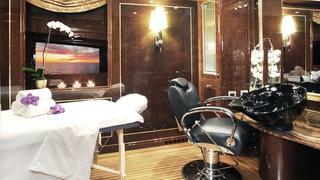 In addition to the gym and sauna, the ultra-glamorous Benetti yacht Diamonds are Forever also has a beauty salon as its bonus room that features a massage table for hair and body treatments. There are certainly some amazing superyacht gyms, but the gym on Benetti’s Cheers 46 is pretty unusual for a 42 metre superyacht. Instead of placing the master suite on the forward main deck, as you’d normally find for a yacht this size, this prime location has been turned over to the gym. 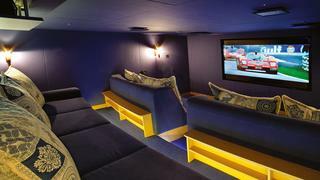 It’s a sizeable gym for any yacht, but what makes it a bonus room is that it's especially huge metre for metre. The reason for the supersized superyacht gym? Apparently the owners are a fit family who all like to wake up and use the gym together; they needed a lot of space and wanted the best views too. There are certainly some amazing superyacht gyms, but the gym on Benetti’s Cheers 46 is pretty unusual for a 42 metre superyacht. Instead of placing the master suite on the forward main deck, as you’d normally find for a yacht this size, this prime location has been turned over to the gym. 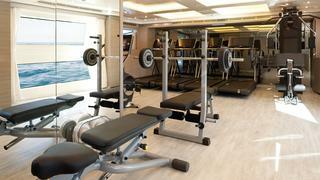 It’s a sizeable gym for any yacht, but what makes it a bonus room is that it's especially huge metre for metre. The reason for the supersized superyacht gym? Apparently the owners are a fit family who all like to wake up and use the gym together; they needed a lot of space and wanted the best views too.